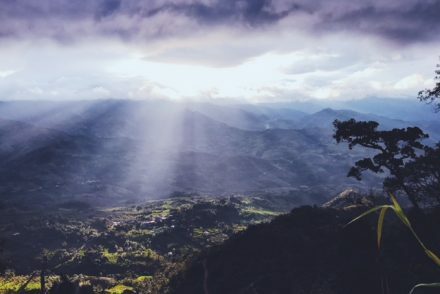 “I find a bit of excitement in telling other people about my country, and letting them know what it is we do here and what Honduras has achieved in the last three or four years,” says Carlos Umanzor, with Genuine Origin sister company Molinos de Honduras (MDH), when asked about his favorite part of his job. After earning a degree in food science from Zamorano, an agricultural university in Honduras, Umanzor began working at MDH in the purchasing department, as the assistant to the head buyer. In 2016, he went to Italy, to earn a Master’s degree in Coffee Economics and Science through Illycaffè (“You learn about the whole coffee supply chain, and everything from the genetics of coffee to latte art”), and then returned to MDH. 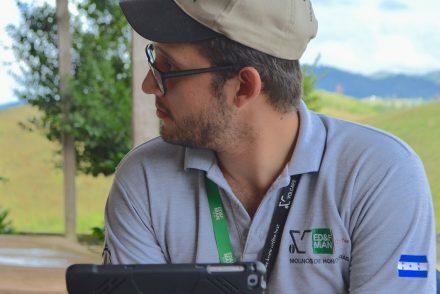 His new role includes everything from visiting producers across Honduras, to helping oversee the production and packaging of green coffees, and helping buyers to find the right lots for them. Carlos Umanzar (in red), leads a group of U.S. roasters, and GO team members Tymika Lawrence and Tony Auger, on a tour of Molinos de Honduras’ operations. Is part of his job also messaging the changes that have taken place in Honduras, and the increases in quality? While it can feel satisfying to put a single face on a coffee — to trace it back to one family farm — that’s almost never the way coffee actually works. We value these community lots for two reasons. One, because they capture the essence of a region, rather than the terroir of a farm. And two, because they’re essential to sustaining coffee communities. While it can feel satisfying to put a single face on a coffee … that’s almost never the way coffee actually works. MDH and Genuine Origin are committed to supporting a sustainable specialty-coffee supply chain. Buying a farmer’s best bags is exciting — but no one feeds his family for a year by selling just his best bags. That’s why our Volcafe Way program works with producers to raise quality, yield and profitability across the farm; and thanks to the size and reach of our parent and sister companies (Volcafe and Volcafe Specialty), MDH can purchase all of a producer’s or even a community’s coffees — and set aside exciting, small selections for Genuine Origin. Umanzor, smiling, describes Mata de Platano as “the new baby girl” of the community lots. MDH and Technoserve, a non-profit that operates in 29 countries, determined the altitudes where the highest qualities were possible, and invested in drying stations in those locations. This eliminated the risk of receiving mixed coffees. Producers would bring, five, six, ten bags, and MDH would dry each one separately, with quality control experts isolating the especially excellent ones. “Immediately, we received cleaner coffees. We were also at the perfect spot to receive the Parainema variety, which has these amazing, delicate, flowery flavors. Which is just the kind of the thing we were looking for. We wanted something that wasn’t as delicate and acidic as the Pacavita, which is the Western region, and not as strong, or with as much personality as Guama Danta, which is more flavors, more fruits and a more balanced cup,” Umanzor explains. As for the drying stations, Umanzor says that technical experts are working with the producers, teaching them to expertly use the stations and be able to deliver the already-dried coffees themselves — which will increase their revenue per pound. He describes Pacavita’s flavors as “the best possible match” between bright red and orange fruits. 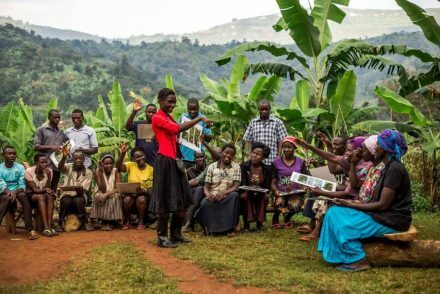 The coffee for this lot largely comes from co-ops that MDF works closely with, like Cafico. 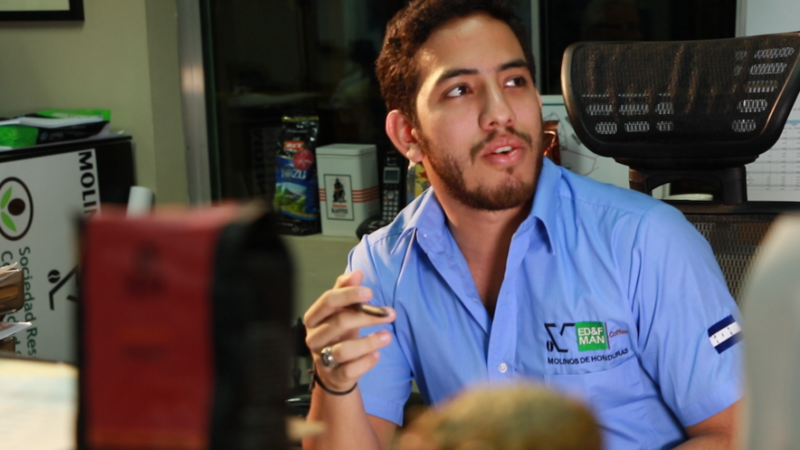 Producer Silvestre Vasquez is a primary contributor to Genuine Origin’s Pacavita — a coffee known for it’s bright fruit flavors and outstanding acidity. Umanzor pauses, searching for the right way to describe the Guama Danta region. “It’s the hub, the mother source of everything — the mecca of coffee in Honduras,” he offers. The Comayagua region, which produces the highest volumes in Honduras, is located in Guama Data, and MDH has aggressively invested in building greater numbers of solar dryers, in order keep lots separated and distinct. On top of that logistical fun, coffees from El Paraiso and Pacavita also go into the same storage room in Comayagua, because it has a better climate for storing coffee. As for flavor, despite the size of the area, and the number of producers, Umanzor says it’s still definitely distinctive. Is it an ideal coffee for an espresso blend? Umanzor agrees, but has his own approach. Samples of Mata de Platano are available now, and boxes will follow in the coming days. Fresh harvest Pacavita and Guama Danta are expected in the store by June 1.